Thessaloniki of the Jews is a comprehensive illustrated presentation of the historic and cultural heritage of the Jewry of Thessaloniki. 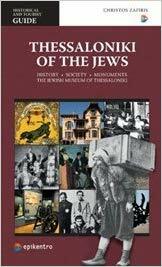 It is an account of the major events in the history of the Jews in this city. Sephardic traditions, Jewish customs, their language and music, great figures, their contributions in the social and economic life of the city, their traditional clothes and food, synagogues, schools and houses. The narration starts from their first arrival in the city, presents their times of prosperity and ends with the Holocaust, which was also the end of their presence in multicultural Thessaloniki.